Another classic SS Day, Dax some 150pts down Ftse nearly 100. ESmini, right of the first bar of the day. Richbois, plotted Stoch on the 15min chart, with 5,3,3 setting, although I am not particularly a fan of maths indicator, it does appear to have some value in determining probable entry and exit. or due to holiday yesterday, does it turn out to be BUY DAY? 1. Do you find it liquid enough to trade? and do you encounter slippages.? 2. May I inquire as to which trading platform you use to trade this instrument. 3. Finally would very much appreciate a chart of yesterday's price action on TF. Sorry Rigel it will be hard to post old charts now. Yes TF is on ICE and liquidity is good during day session and maybe 1 hour before open. Other times is riskier. I rarely get slippage more than 1 tick but could be worst during news. Again sorry I see many posts but it will be hard to answer all off them as they are old by now and I would hate to play Monday morning quarterback. 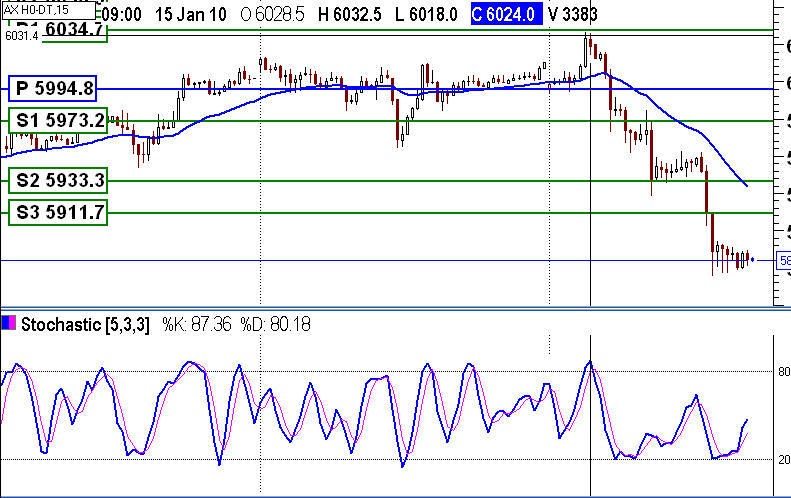 as to the stochastic I use it for OverSold and OverBought indication and for divergence. I beleive that Mr Lane the creator of the indicator also prefer the divergence use of it and not any crossing of lines. That is why you will notice that on most of my charts there is only 1 line D% not to get influenced by the crossing signals. Tried those before and lost enough trying to use the crossing signals. So far today was a text book TTT Buy day. ES TF and NQ opened and tested the Previous Day session high and failed to take them out and therefore reversed. We knew this was a Buy day and that we needed a decline so any excuse to short was good. If you missed the entry at the open we were given a second chance at 10.06 EST after a nice ABC up pattern. TF then dropped 14 points without touching the walls on the way down. As I am writing this it took 35-40 minutes for ES and NQ to manage to go lower. At this point who cares money is in the bank and day is done. do the TTT levels work well on that market in your experience and do you trade off 15min charts. 2. As for Stochastics, I presume you are using 5,3,3 setting, do you keep that setting across other timeframes besides 15min ie. 5min, 3min etc. wonder what are your readings. I do look at the 15 min chart but only to see the bigger short term picture. 1080-1110 is a big support zone, if that breaks, then it could be all the way down to Nov. lows.